An established author walks into a bookstore to do a reading from the first book he has published in ten years. But no one has shown up to see him. Sound like a writer’s nightmare? Or the set-up for a sad joke? 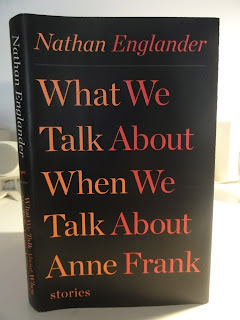 It’s actually the premise of The Reader, a short story that is part of Nathan Englander’s new collection What We Talk About When We Talk About Anne Frank. Englander’s protagonist experiences a Rip Van Winkle moment that plays out over and over again: the world has passed him by while he retreated to his room to write his novel and his readers have moved on--save for a lone auditor who follows him from reading to reading. Raymond Carver's What We Talk About When We Talk About Love. My discovery of Englander’s work was one of those happy instances of one very talented writer leading to another. At an informal event author Colum McCann (Let the Great World Spin, Zoli, Dancer ) named Englander (his teaching colleague in the MFA program at Hunter College) as one of his favorite authors. This led me to the New Yorker and the story for which the collection is named. Combining a startling mix of orthodox Jewish doctrine, pot smoking and the dynamics between spouses and friends, Englander shows what happens when two couples spend an afternoon together in suburbia playing a dangerous game of “what if”. What do I like so much about Englander’s work? In contrast to much contemporary short fiction that I've read, things happen in his stories. Events unfold in such a way that unsettling truths are revealed, issues of life and death are confronted, degrees of guilt are examined, faith and loyalty are tested. But there is also considerable humor in the stories and many of the central characters display touching vulnerability. A few months ago I heard Englander speak as part of an inspired pairing at the NYPL; he was interviewed by the impressive Sarah Jones, a performer and playwright whose work recalls Anna Deveare Smith (though perhaps with a lighter touch.) The issue of whether Englander, who describes himself as “a God-fearing atheist”, considers himself to be a Jewish writer came up that evening, as it has frequently in other venues. Englander prefers not to adopt that term, but rather reports that his writing grows out of his personal experience. In a lighter moment Englander described his meeting with Philip Roth, in which the older writer complained that Englander had not been punished enough for his sometimes less-than-flattering portrayals of Jewish characters. The evening at the library felt a bit like crashing a family party. Englander’s mother was in the front row, and various friends and relatives were scattered throughout the audience—including two young people in the row behind me. Englander greeted a number of them by name. One had the sense that the extended family might not all agree with Englander’s secular world view, but that they had agreed to disagree. You can watch a video of this lively interview here. Jonathan Safran Foer and Nathan Englander discuss The New American Haggadah, their take on a traditional Passover prayer book. The Haggadah recounts, through prayer, song, and ritual, the extraordinary story of Exodus, when Moses led the Israelites out of slavery in Egypt to wander the desert for forty years before reaching the Promised Land. 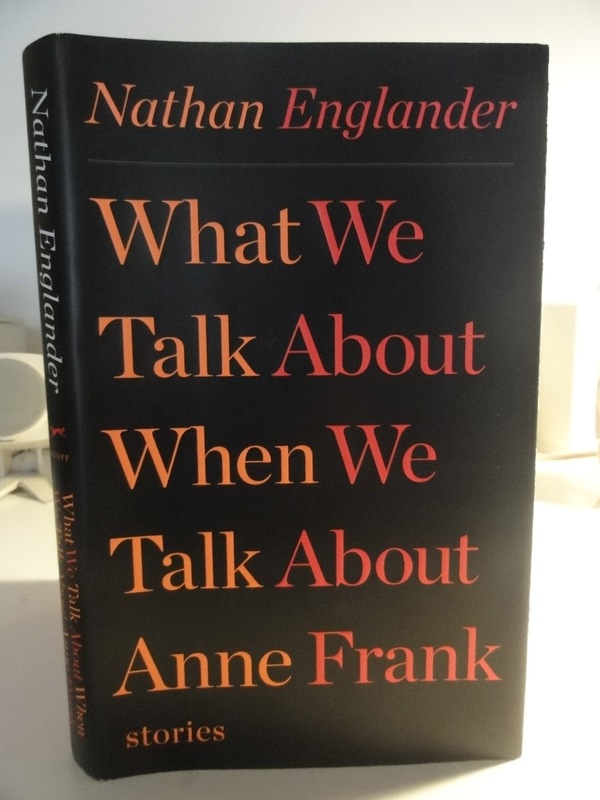 Safran Foer edited Englander's translation, and major Jewish writers and thinkers like Jeffrey Goldberg, Lemony Snicket, Rebecca Newberger Goldstein, and Nathaniel Deutsch also provide commentary. It is designed and illustrated by the Israeli artist and calligrapher Oded Ezer. "In contrast to much contemporary short fiction that I've read, things happen in his stories." This is one reason I stopped reading new short fiction many years ago. I love Sarah Jones. I saw her many years ago in a fundraiser for an international women's rights org that AWE took me to. *Equality Now, mentioned on Sarah Jones' website. Sarah Jones was amazing. I hope to see more of her soon.